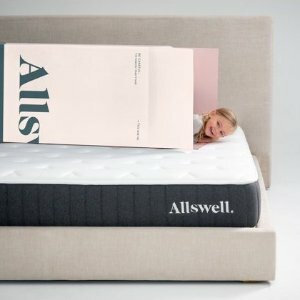 Walmart offers Allswell 10 Inch Bed in a Box Hybrid Mattress, Multiple Sizes from $185. Twin for $185; Full for $245; Queen for $259; King for $320. *Foam & Coils: The best of both worlds: High-performance, CertiPUR-US® certified memory foams layered for ideal comfort and support. Coils provide the classic comfort you'd expect from a high-quality mattress. Allswell's coils are individually wrapped to minimize motion transfer. *Crafted in the USA - new manufacturer based in USA.